A little late posting but I do want to document this big moment! 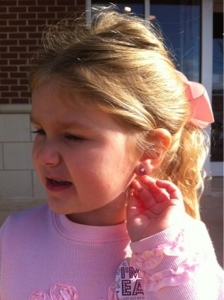 Ella Kate has been begging for a while to get her ears pierced. She had money left over from her birthday and we had planned a fun filled day to go to the Galleria mall to see Santa (that was a secret though). 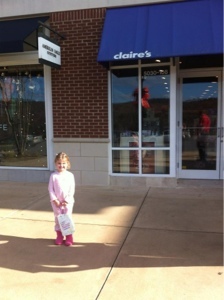 We stopped in Trussville for a quick doctor check up, to eat and went to Claire’s because that’s where Emily had hers done at. At the doctors office EK had to pee in a cup (hard to do for a 4 yo) so to convince her to go I told her “our secret” to go see Santa and not to tell Emily! As soon as we got in a room she told her as fast as she could! It was so cute to see the excitement her telling Em our secret…I’m not good at keeping secrets either! While eating I asked her since we were right there did she want to get her ears pierced and of course she said yes! She was ready and excited until the first one went in and I was a little worried she might not do the other one, but with a little convincing she did and she was more than excited to see the new bling on her ears. She cried and quickly I said let’s go pick out some new earrings and she stopped immediately. She changed them the first time on Christmas Eve to a pair of owls that matched everything she got for Christmas. She loves them and wants everyone to see them by pulling her hair into a ponytail most days. She was a big girl to be only 4 years old. I was so proud of her.